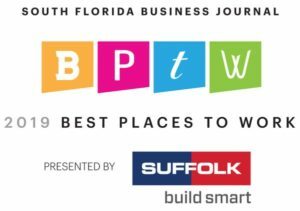 Join South Florida Business Journal in honoring the 45 Best Places to Work in South Florida at this fun, energetic awards program. Join South Florida Business Journal in honoring the 45 Best Places to Work in South Florida at this fun, energetic awards program. Register EARLY. This event ALWAYS sells out! South Florida Business Journals recognizes South Florida companies that build workplace culture. Nominees will be announced starting Monday December 17 and will be divided in three categories: small companies (10-49 employees), medium companies (50-99 employees), and large companies (over 100 employees). Tickets: $95 per individual ticket or $2,350 for a table of 10 (table sponsorships include 10 t-shirts!) Reserve your table early – this event sells out every year! Event Attire is Casual: Jeans and T-shirts for everyone. For more information, contact Maureen D’Silva at mdsilva@bizjournals.comor 786-533-8202.